3Uz. Dr., İzmir Katip Çelebi Üniversitesi Atatürk Eğitim ve Araştırma Hastanesi, Göz Kliniği, İzmir, Türkiye Purpose: To evaluate the effi cacy of an intravitreal dexamethasone (DEX) implant versus intravitreal ranibizumab (RAN) for chronic diabetic macular edema (DME) in Type 2 Diabetic Patients. Materials and Methods: In this retrospective, comparative, cohort study, 28 eyes of 22 patients were received DEX implant at every 24 weeks. Thirty-seven eyes of 30 patients were performed RAN injections on pro re nata (PRN), immediately after three loading doses. 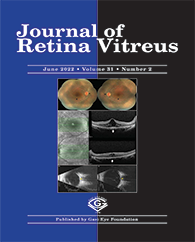 Main outcome measures included best-corrected visual acuity (BCVA) and central macular thickness (CMT), intraocular pressure (IOP) and incidence of side effects in both groups. Results: The mean change of BCVA for 12 months was -0, 11 Log MAR in DEX group and -0, 55 Log MAR in RAN group. There was a statistically signifi cant difference in BCVA between the DEX group and RAN group at month 6 and month 12 (p =0.0001 and p=0.0001). Mean CMT was significantly decreased in both groups from the baseline to month 6 and month 12 (DEX: p=0.001 and p=0.0001, RAN: p=0.0001, p=0.0001). Mean changes of CMT for 6 months and 12 months were -80 μm and -127 μm with the DEX group, and -204 μm and -227μm with the RAN group. Mean IOP increased remarkably in the DEX group compared to the RAN group. However, 7 eyes with IOP higher than 21 mmHg were well controlled with topical anti-glaucoma drugs in DEX group.